Eye health in children could seem a little evasive as some of the warning signs get passed off as new behaviours in children. Sure, these behaviours might be considered as milestones but this is also the reason why parents have a hard time determining if their child has eye problems. Here are some typical behaviours you should look for. Needs to have books very close to their eyes when reading even if the text size of the material is too big. When these materials are placed on a table and they’re sitting in front of it, they still can’t read anything. Squints or blinks too often. Tilts their head to one side to see well. Observe if they do this whenever they’re watching television or looking at a picture. Rubs their eyes too frequently even if they’re not sleepy. Closes one eye to see better. Doesn’t like playing near-vision activities like coloring, playing board games and doing schoolwork. Take note of the reasons they’d give you whenever you try to invite them to do any of these activities. Doesn’t like to engage in any distance-vision activities like watching planes in the sky or playing Frisbee with a dog. They might also have issues in seeing small objects at a distance like reading the texts from a blackboard. Seems very sensitive to light even if this light is amenable to others. Complains of tired eyes and headaches at the end of the day. The same still happens even if your child didn’t engage in any rigorous activities during the day. Is often involved in tripping accidents. In their defense, they’re not able to see any hazards such as steps and curbs in their way. Has a hard time distinguishing different colors. He can’t tell blue from red. Can’t see anything in low light or during the night time. Can’t follow an object visually. Skips lines of text when reading a book. Has a white pupil instead of black. Carefully go through the list and assess if you’ve seen any of these signs in your child. The earlier you pay attention to these signs, the earlier your child can be diagnosed and treated. This is an eye condition which causes the child to have blurry or reduced vision. If untreated, this can cause loss of vision and loss of depth perception. Contrary to popular belief, a lazy eye is not solely about a problem with the eye but the connection to the brain. Fortunately, there are treatments available for lazy eye. The earlier this treatment is given to a child, the better. Due to overuse of technology, red or dry eyes has become one of the most common eye problems experienced by children. This condition is caused by spending too much time on a digital screen such as laptops, smartphones and other gadgets causing dry, itchy and red eyes after watching a screen for hours. To reduce the discomfort, enforce the 20-20-20 rule. Instruct your child to take a break for 20 seconds for every 20 minutes on the screen and have them look 20 feet away. This simple solution will relax your child’s eyes, which can help restore their normal blinking patterns. 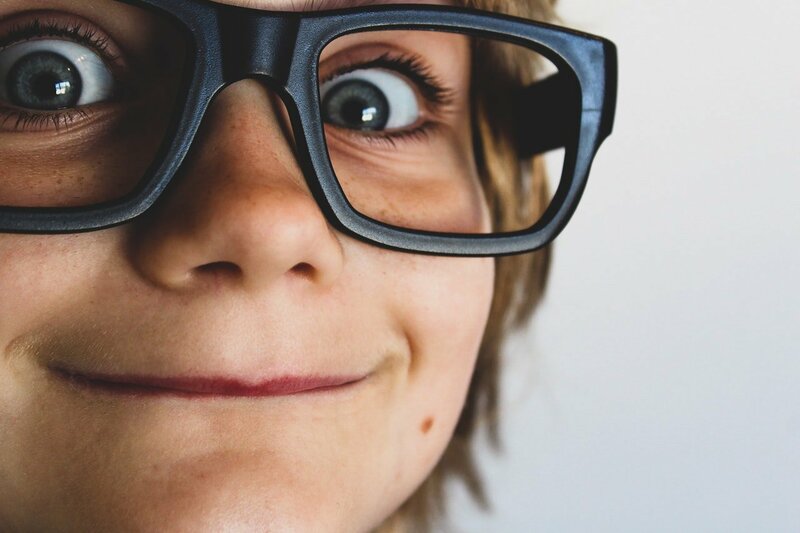 Nearsightedness (having difficulty seeing anything far away), far-sightedness (having difficulty seeing anything too close) and astigmatism (the cornea of the eyes are irregularly shaped causing blurry vision) are also common among children but can be corrected with glasses. However, as your child grows, their prescription is likely to change. Make sure to have regular visits to your ophthalmologist so your child can wear glasses appropriate for their age and needs. It’s always better to teach your children to eat healthy foods while they’re still young. This trait is something which they can easily practice as they age. This is also one way of keeping their vision healthy. Serve foods which are rich in Vitamin C, Vitamin E and Zinc as often as possible. These foods contain nutrients which are essential for eye health. To keep your child’s eyes healthy, activities which actually stimulate their eyes can help- similar to how you would work out in order to be physically fit. Spend some time with your child by introducing different colors and shapes to them. Make this activity more fun by using their favorite toys as your tools. Colouring crayons, stacking blocks and shape sorters are also excellent options. When you do these activities together, you’re not only protecting your child’s eyes but you’re also bonding with them – that’s a win-win for parents like you! Establish how many hours your child should spend watching television or play on a tablet. Imposing hourly breaks during screen time is also important. Always encourage your child to play outdoors with friends or family. Not only does this automatically reduce screen time but outdoor play also has significant impact on your child’s physical development. This is also an excellent avenue for your child to meet other people and different life skills. Jessica is a professional health expert who works for some major health industry giants. She currently writes for Membersown and is dedicated to helping people learn more about health-related topics along the journey. When she’s not a health advocate, she enjoys some downtime travelling or spending time with family.